Description: This extra large condom that will satisfy your need. 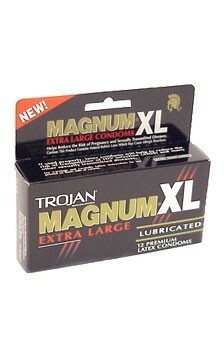 Trojan Magnum extra large is larger than original Magnum. Tapered at the base for a secure fit. Silky smooth lubricant for comfort and sensitivity. Special reservoir end for extra safety. Made from premium quality latex to help reduce the risk. Individually electronically tested to help ensure reliability. Triple tested Trojan quality. Largest size condom we carry - 30% larger than the standard condom. Finally something for the big guys!